How can I get this SSTO to orbit? So, I just created a new SSTO that has about 5,000 meters per seconds of deltaV, but I can't get it into orbit. It goes well until I hit the higher atmosphere, and then it screws up. Can someone please help? Goes out of control ? Overheats ? Accelerates but runs out of fuel before getting to orbital velocity ? Plunges back towards the ground ? Or simply fails to accelerate ? 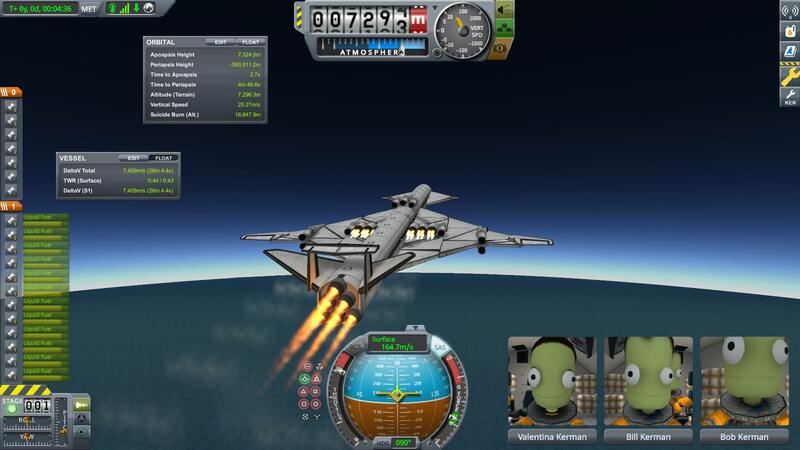 The SSTO starts running out of delta-V and begins to lose altitude, even though my speed is above 1000 m/s. It also begins to become harder to control. I am assuming that you are using RAPIER engines. 1000 m/s is not fast enough for rocket mode. Rapiers can get you to 1400-1500 in level flight in airbreathing mode. Level off at 17-21km for your "speedrun". Once the acceleration starts to die down, switch to rocket mode and pitch the nose up gently so that it's pointing 5 degrees above prograde. For the loss of control problem, i suggest installing the mod called RCS build aid. It shows a red ball in the SPH which is where your CoM will be when the tanks are empty. It could be that you have more fuel at the front of your ship than at the back and your CoM is shifting rearward, causing instability , later in the flight. Alternatively, your engines are not in line with the airplane's centre of mass. This can happens with engine pods mounted low under the wing or above the fuselage - and as the air gets thin, the torque from the off axis thrust overwhelms the aerodynamics. RCS build aid helps with this too, it gives you a torque number which you can try to minimise. Finally, you can make it easier to make small adjustments to your flight path (you need to be gentle at very high speed) by right clicking on control surfaces (Especially pitch / roll control ones) and using the "limit authority" slider. When flying to orbit you never want more than 10 degrees pitch anyway. Great, thank you. Hopefully, I can get this thing into orbit. It is far too busy. Loads of stacks and stuff all over the place. You need to simplify and streamline it. It could be that you have more fuel at the front of your ship than at the back and your CoM is shifting rearward, causing instability , later in the flight. This seems like a major suspect. You have a lot of heavy engines at the very back, and not a lot of weight up front to balance it out. With other improvements, you can probably lose some engines. But also consider ways to move your engines further up. The real-life Skylon spaceplane concept, which has engines at the wingtips, is a good example. This too for sure. It's kind of a vicious cycle. When a plane is draggy you need to add more engines, which add extra weight, shift mass around, and generally cause as many problems as they fix. I can't tell for sure based on the screenshot angle, but you don't have much wing at all for something that size. And wings that angle up or down (dihedral / anhedral) have less lift still. BigS wings are really good as they are big (so decrease part count and floppiness), have high heat tolerance, and can store fuel. All the little protuberances (RCS ports, solar panels, antenna) add drag. If possible, either eliminate or stow in your cargo bay. On the antenna note, you can get by with the basic one if you're just in LKO. Might not need any at all. If you really need RCS (and you probably don't unless docking with a space station or whatnot), consider using Vernors instead. They're lower drag, more powerful, and then you can get rid of monoprop altogether. On that note, you have a LOT of monoprop. Not sure what your mission is, but you likely won't need all of it, so can trim some weight there. Those airbrakes on the front of the plane are going to kill your stability when deployed. If you need them, move to the back. Echoing @AeroGav, KER is showing a lot of torque. This is likely because your center of thrust is above or below your center of mass. This will make your plane want to pitch up/down, which will force your control surfaces to compensate (adding drag). At least at the outset, I'd ditch the nukes. They're great for long-range, low-thrust stuff, but if you're just trying to get this thing to orbit, they're not really in their wheelhouse. Your readout shows only 2200 ISP - it should be 3200 for Rapiers in jet mode. Do you have something else going (rocket mode Rapiers, the nukes, etc) when you start? That FAT tailfin is liable to blow up -- its heat tolerance is really poor. You don't need much (or possibly any) yaw control, so consider replacing with a wing segment. Also move to the back - that's what makes it work as a stabilizer (think fins on a dart or arrow). Thanks for the picture. I'm surprised it flies at all ! 2. Too much of the airplane's dry weight is at the back of the ship. You can see the yellow ball is at the back of the cargo bay. All of the cargo and most of the fuel is in front of the yellow ball. When these are gone the airplane will be very tail heavy. 4. Pitch controls are very close to the centre of mass. This might correct itself if you can move the CoM forward a bit, or you will need to add some canards. 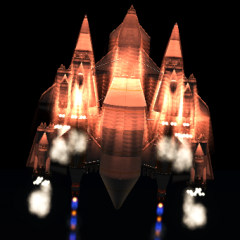 Fuselage generates most of the drag in KSP. I suspect that due to the poor flying qualities of that airplane, it is only able to get enough lift by pitching the nose far above prograde and is only able to maintain control by operating the control surfaces at large deflection angles. I suspect this is especially the case at high altitude. 3) Your Com is going to shift way back after deploying a payload and using fuel. Move your side engines forward by a lot... along with some wings, your CoL seems pretty far back for flight on takeoff. You also seem to have way too much oxidizer. Based on KER readout, all of your tanks are LfOx ones. 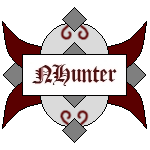 Nukes don't use oxidizer, nor do rapiers in air-breathing mode. You can safely replace half of your fuel tanks with Lf-only ones (Mk3 does have those, right?). That should give you some extra dV. If it were me, I'd start again with an airframe that looks vaguely plane-ish. Why would anyone put airbrakes there anyway, of all places? If you wanted to de-orbit back-end first then they could be very handy there. What, give up pretty much all control, and all that lovely high-AoA braking? Of course you do need reasonable wing area for that. I suppose you could re-enter facing the wrong way, but why would you, there's no advantage. More heat-resistant parts in the direction of travel? I would think opening a mk 3 cargo bay would also generate quite a bit of front-side drag, if one were so inclined. Perhaps, but then a controlled lifting re-entry largely removes the need for that heat tolerance. If you're not going to use those wings to control your descent, why not just put a 'chute on the nose and be done with it? I don't know much about stock aero these days, but at least in FAR a craft that is stable going backwards is probably a bear to fly going forwards. I'll take stability in normal flight over a little more heat-tolerance any day of the week.